tranquil, yet spiritual space for meditation and prayer. We currently offer two hand-tied wood models that are imported from Brazil. decor items and gifts > Wall Rosary Page (you are here). 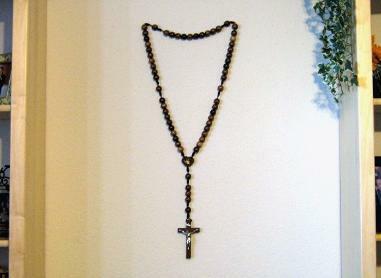 Beads: 19mm, Center: 2.25", Crucifix: 4.75"
Beautiful Divine Mercy Wood Wall Rosary imported from Brazil. Wood beads (19mm-3/4"), Crucifix (4.25") and center (1.5")are all beautifully stained and hand tied with dark brown cord. Corpus and sign (INRI) are metal. Heart shaped center bears a recessed image of the Divine Mercy covered with clear epoxy. Makes a beautiful, spiritual gift. Total length = 3 feet. Charity if you Prefer. It's Quick & Easy! See Instructions During Checkout. Catholic Churches & Charities - Click Here for a link to help increase our donations to you.